RAMEN. The noodle based soup dish everyone is talking about, instagramming photos of their steaming bowls with chopsticks in hand. It’s no longer the cheap college meal in styrofoam cups, but instead savory broth and satisfyingly chewy noodles. The bummer for us gluten-free folk is that ramen noodles are wheat based. But, have you seen the relatively new Lotus Foods rice ramen at Whole Foods, or maybe your local coop? There are different varieties, made from just gluten-free ingredients like jade pearl rice, forbidden (black) rice, millet, buckwheat, and brown rice. All you do is boil for 4 minutes, and you have tasty gluten-free ramen that holds up well. Which is why I love to use the noodles to make other meals besides soup! 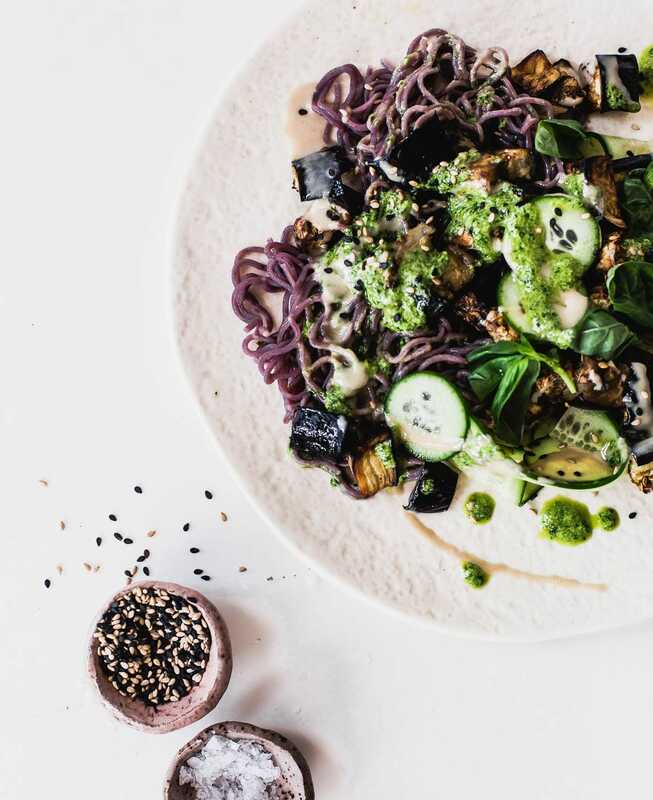 For this salad I used the purple potato and brown rice ramen, tossed with roasted eggplant and green tahini sauce, a satisfying and flavorful recipe from the More with Less cookbook, written by the very talented Jodi Moreno of What’s Cooking Good Looking. 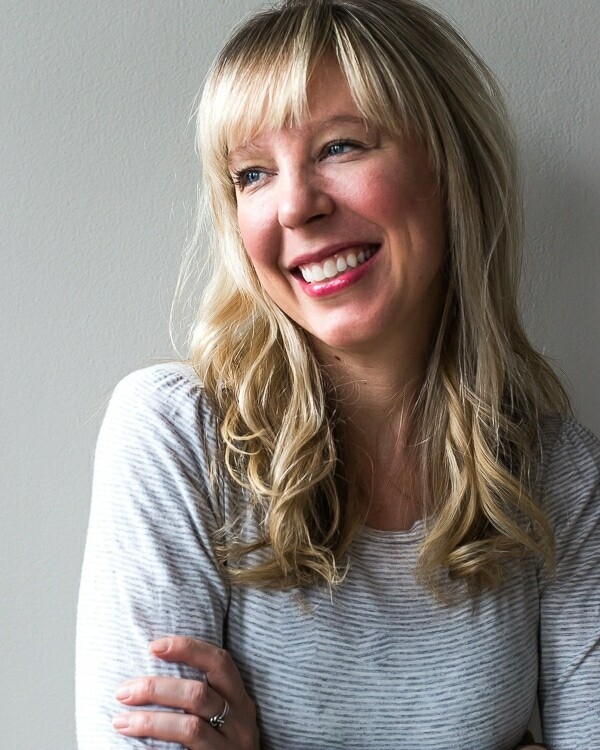 Her book is based on the philosophy of whole food cooking and innovative techniques, with an emphasis on an arsenal of condiments that can transform any meal. They’re the secret weapon for meals on the fly! And when your refrigerator is stocked with sauces and dips galore, I find the pantry becomes even more powerful. 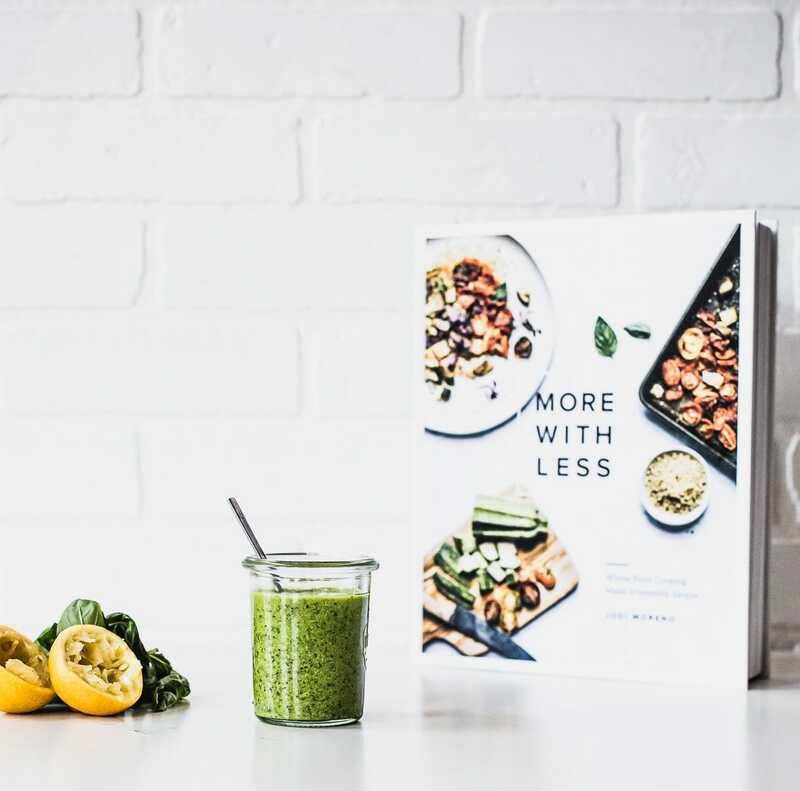 Deliciously healthy ideas, and recipes full of texture and flavor that you’ll want to eat with both your eyes and your appetite. Her green herb tahini is incredible. I’ve been eating it on everything from this noodle salad, to eggs, avocado toast, and as a veggie dip. I couldn’t wait to make it, as I had picked up a jar of tahini from Seed and Mill when I was in New York, and hands down, it is the smoothest, creamiest, tahini I’ve ever had. They source Ethopian sesame seeds and mill it fresh on site. I doubt I’ll every buy another brand again. 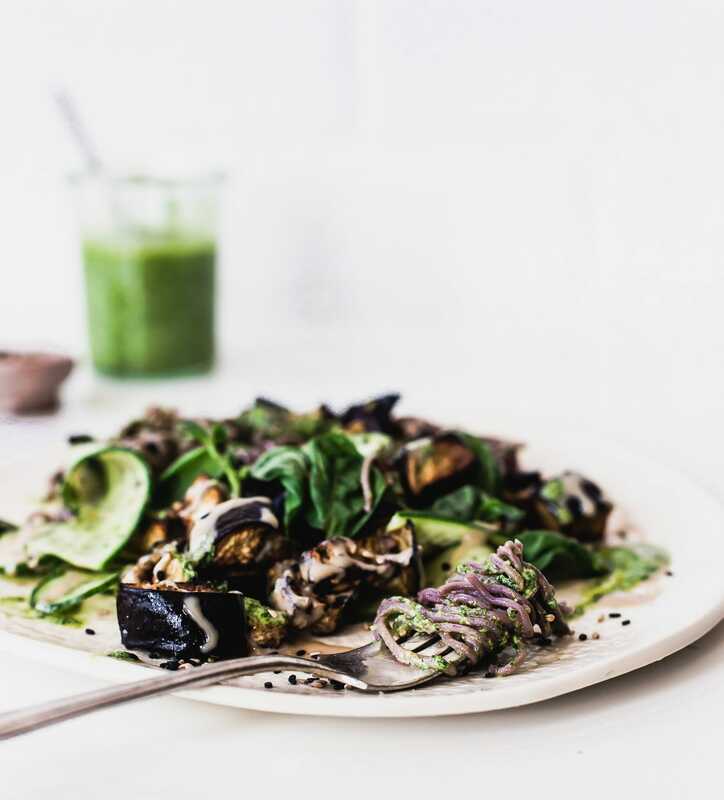 This summery salad is refreshing and nourishing, and such a good reminder of how delicious roasted eggplant is. Roasting it in cubes keeps it tender and meaty, and it’s earthy flavor is complimented by the green herb tahini. I’m guessing this dish would be excellent with cauliflower or roasted zucchini as well! To brighten things up, I added shaved cucumber ribbons (a vegetable peeler works great for this), and toasted black/white sesame seeds for crunch. And since I love the light spiciness of basil, I threw on a handful of torn leaves too. 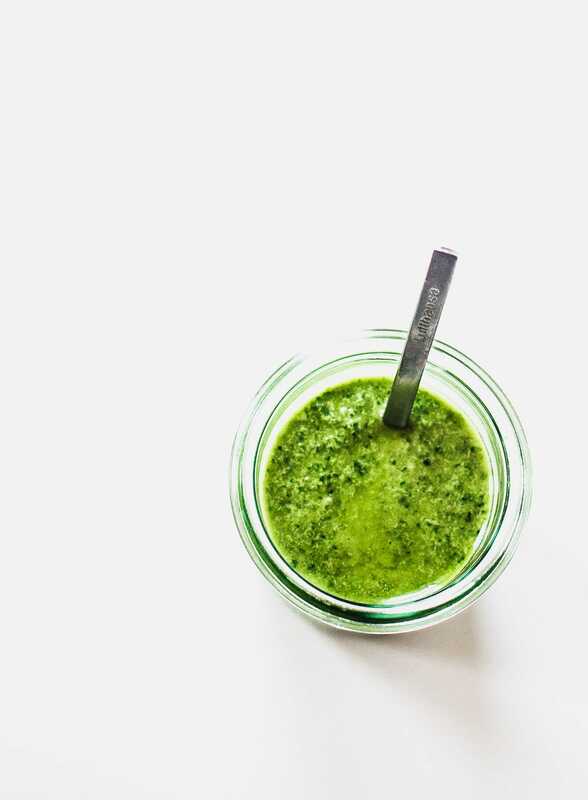 For Green Tahini: Put parsley, cilantro, basil, tahini, garlic, lemon juice, and salt in a food processor. Pulse a couple of times, then slowly drizzle in olive oil while machine is running, to bring it together. Will keep for one week in refrigerator. For Salad: Preheat the oven to 400 degrees F. Place eggplant on large baking sheet, and drizzle with olive oil. Don't skip here, because eggplant is super absorbent so it will really soak in. Toss with salt, and roast for 30 minutes, or until golden brown. While eggplant is cooking, cook the noodles according to the instructions on the package. Strain, transfer to a bowl, and toss with 3 tablespoons tahini sauce. When eggplant is finished cooking, add it to the bowl, drizzle with two more tablespoons tahini sauce, and toss to combine. Plate, and add cucumber ribbons, sesame seeds, and torn basil. Put parsley, cilantro, basil, tahini, garlic, lemon juice, and salt in a food processor. Pulse a couple of times, then slowly drizzle in olive oil while machine is running, to bring it together. Will keep for one week in refrigerator. This noodle salad looks absolutely beautiful! I really like the tahini sauce that is paired with the fresh ingredients. 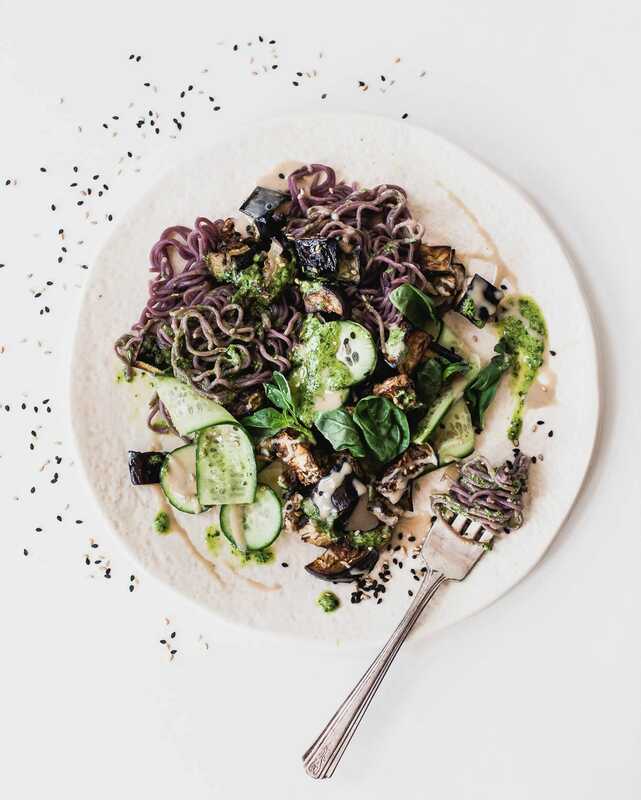 Never would have thought about using the black rice ramen noodles, but I TOTALLY have to try them now. They look absolutely incredible! Oh this looks AMAZING! Would you believe that I hardly ever eat tahini?! I regret not visiting Seed and Mill when I was in NYC last year, but I think I’m going to have to add it to my list for next time.